Product Details-Use-high levels of proteins and moderate levels of fat to help maintain muscle mass. Helps reduce the risk of renal failure.Suitable-For Sterilized cats.Quantity-400 Gm. 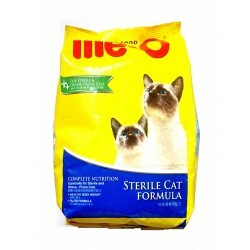 Product Information -Premium food indicated for sterilized cats over 10 years of age.Helps prevent obesity in sterilized cats-Through its reduced level of metabolizable energy, a high fiber content to promote satiety, high levels of proteins and moderate levels of fat to help maintain muscle mass. Helps reduce the risk of renal failure (CKD)-thanks to its reduced phosphorous content and moderate levels of proteins. Helps prevent the formation of calcium oxalate and struvite stones in urine-Includes a special combination of ingredients and minerals that provide an optimal level of urine.